Elbow dysplasia is a broad term used to describe three different disease processes associated with the abnormal development of the elbow joint during growth. 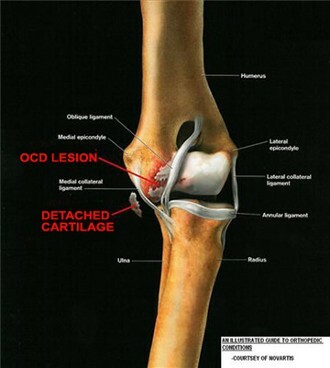 These processes are referred to as osteochondritis dissecans (OCD) of the medial humeral condyle, fragmented medial coronoid process (FCP), and ununited anconeal process (UAP). Although, the cause of elbow dysplasia is not fully understood, it is believed to have genetic and environmental components, i.e. nutrition, exercise and growth rate. Lameness is usually first noted around 6 months of age and is most commonly seen in large to giant breed dogs such as, Bullmastiffs, German Shepherds, Bernese Mountain Dogs, Labradors, Golden Retrievers and Rottweilers. The success of surgery depends on a numbers of factors: the age of dysplasia development, the rate of progression, the age of the patient when symptoms are diagnosed and the degree of arthritis already present at the time of surgery. Surgery cannot reverse arthritis that is already present but can help halt its progression. Recovery from surgery generally takes about 6 to 8 weeks. Osteochrondrosis is a disruption of the cartilage development in large breed, rapidly growing dogs. As normal growth occurs the cartilage on the end of long bones (humerus, femur) must ossify/ calcify or turn into bone. If calcification does not occur properly the cartilage becomes thickened and prevents joint fluid from reaching the other cartilage cells underneath. Without joint fluid these cells breakdown, causing cracks in the cartilage. This defective cartilage does not properly adhere to the mature bone that is already present, disrupting the normal gliding motion within the joint causing pain, lameness and eventually arthritis. During movement these cracks can loosen, forming flaps that can break off andfloat freely within the joint interfering with normal function. In some instances, the flaps can actually use the nutrients in the joint fluid and grow larger becoming what are referred to as "joint mice." 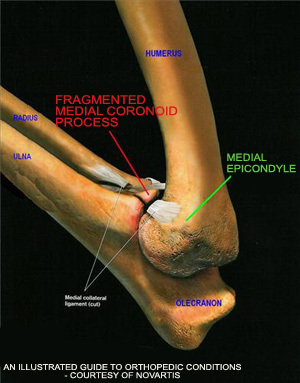 OCD of the elbow occurs on the medial condyle of the distal humerus. Clinical signs include intermittent lameness of one or both front legs and pain on manipulation of the elbow. Diagnosis is made through a physical exam and radiographic visualization of a defect on the humeral head. Once lameness is exhibited medical management is usually unsuccessful and most dogs require surgical removal of the cartilage flap. 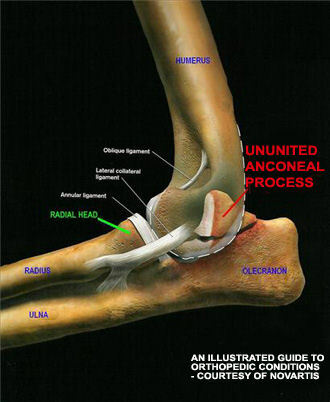 The anconeal process is a large piece of bone located at the growth plate at the top of the ulna. Normally, in growing dogs, this area will close or fuse between 16-24 weeks of age. An ununited anconeal process is the failure of the anconeus to fuse with the ulna. Instability within the joint leads to damage of the articular cartilage, lameness and arthritis of the elbow joint. Radiographs and a physical exam confirm the diagnosis. Surgical treatment is necessary to correct this condition and requires removal of the bony fragment.